Don't let a little snow and cold weather bring you down. Spring weather is just around the corner. Once I got back from my business trip last weekend, I was ready to party. I was so excited because Sunday, March 20th was an important day for me. 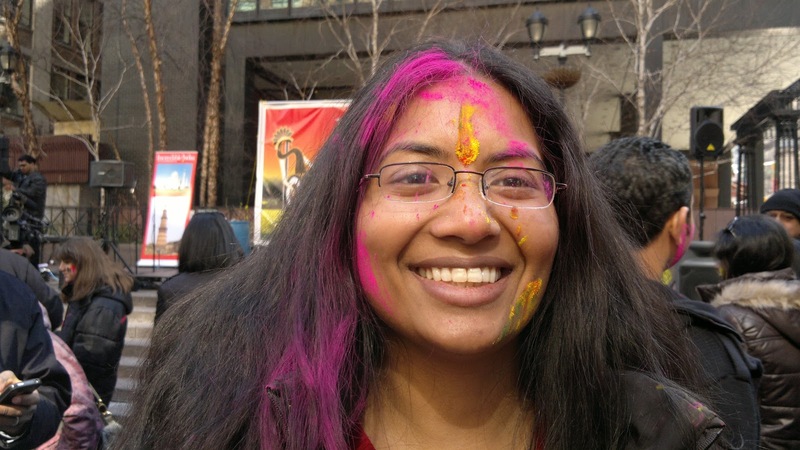 It was the first time I would be celebrating Holi (Spring Festival) in New York City in over 15 years. Holi, "the festival of colors", is celebrated by people throwing colored powder and water on each other. Not even the cold temperatures would stand in my way! In North India, people specifically wear white on this day so the color shows out more. The celebrations typically can be from 3-16 days. If I were in India, I would go out into the street and enjoy with all of my friends and family. Alas, NYC is not India, but it was close enough. 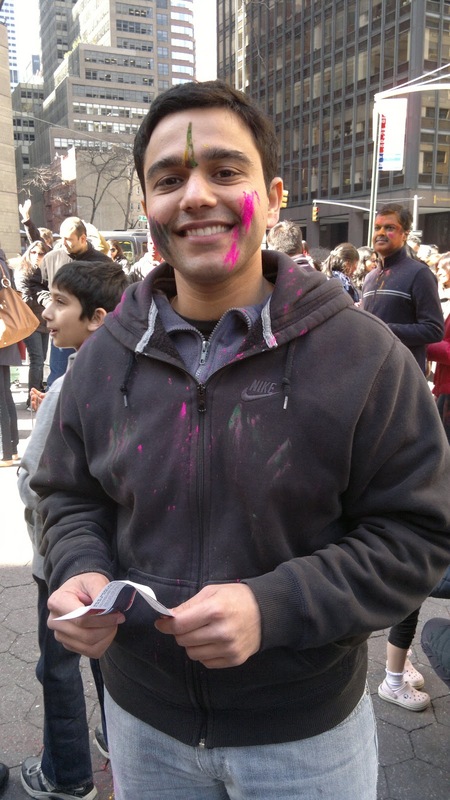 The Holi celebration was hosted by NYC Bhangra and it was a FREE event. It's nice to know there are still people out there following our culture and feel it's important to share with everyone. My friend Avaneesh and I drove into the city for the festivities and had the time of our lives. Even though we parked the car a few streets up from the park, we could hear all the hangama from where we were standing. I couldn't wait to join in the music, the people, and the colors. As we made our way to the festivities, we saw people with colorful faces walking out of the park with big smiles. The festival was full of surprises including an exciting performance by New York Masti, an all Indian Female A Capella group. Also there were various types of dance performances from Indian Classical to Bollywood, Flamenco and Bhangra. Here's a glimpse of one of the Bhangra performances. During all the performances, the event's volunteers worked their way around the audience and smeared colors on people's faces. 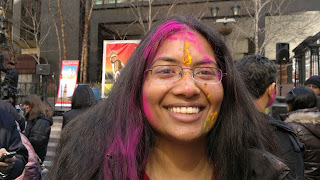 My friend Avaneesh got lucky and the girl with the colors just put a tikka on his face and walked away. I grabbed some color off the plate and smeared some on his face. HA! It's not Holi without color all over your clothes. Good thing he wore his old clothes. He looks too happy in this picture, doesn't he? He grabbed the color I hid in my hands and smeared it all over my hair...hey, at least now I don't need to go to a salon for highlights. We were having so much fun that we worked up an appetite and were so glad they served delicious Indian food for a minimal price: samosas, chaat, chole kulche, pani puri, wadaa pav, keema pav, biryani, masala chai and lots of sweets. It was truly an awesome day. After the festival, we drove back and ate more goodies; the halwa I made for the holiday. In my our culture, we do two things on every holiday: wear new clothes and make something special for the occasion. 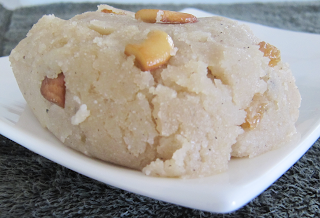 You can't tell but I wore a new sweater and I made Sooji Halwa. It was my first time making it and you know what, it came out pretty well. So from our family to yours, Happy Holi!! I did. 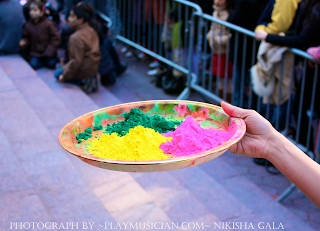 Last night I bought colored powder from the Indian store so I can celebrate it with my family next year. Maybe you can do that too. Thanks for the comments. 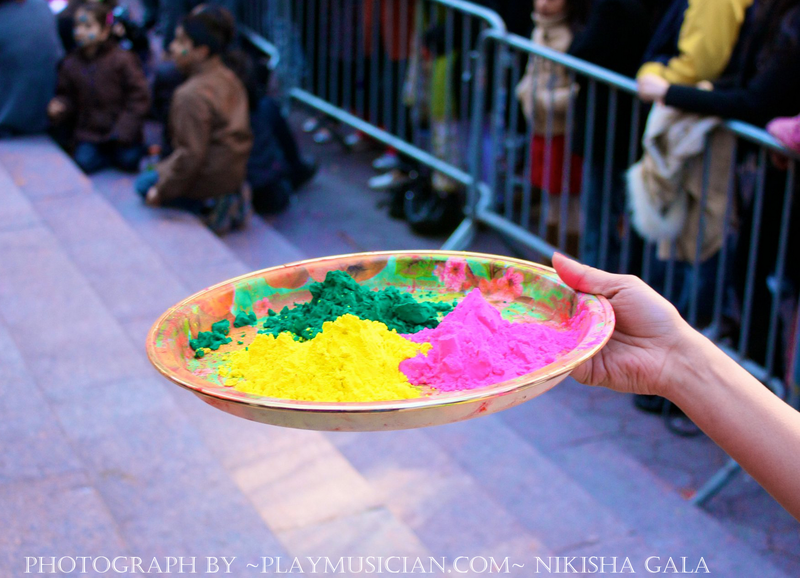 Can you please tell me where I can purchase this colored powder in NYC? You can buy it at any Indian grocery store...in the city, I would suggest going to Jackson Heights. I bought it around the Holi holiday so check to see if they still have it. Good Luck.